HW PARTNERS‘ board members are often in the media. Thanks to their outstanding know-how and expertise in the area of cloud computing, they are sought after as participants in interviews and panel discussions, as well as keynote speakers, at cloud related events and trade fairs. Many times we have been asked to give our input to online and print media, too. We present to you some selected clips and press releases below. 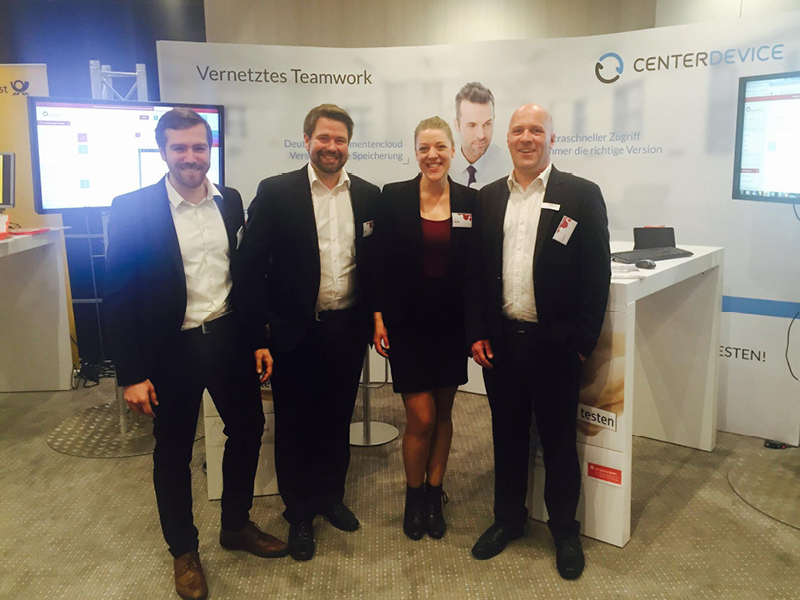 At the Cloud Unternehmertag 2019 we talked to Christian Solmecke, attorney at law about the possibilities of automation in law firms, about cloud based software and social media for lawyers. 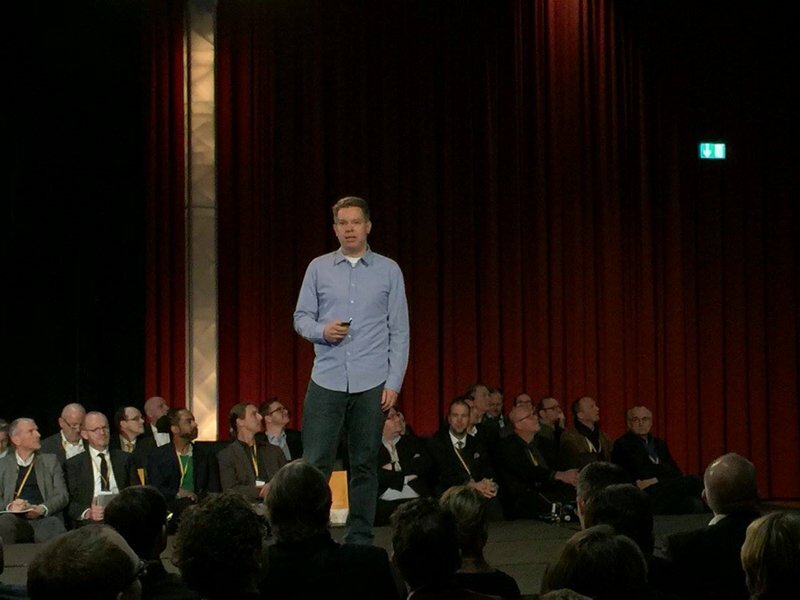 In this video Scopevisio founder Dr. Jörg Haas points out , why it is worth it to attend the 7. 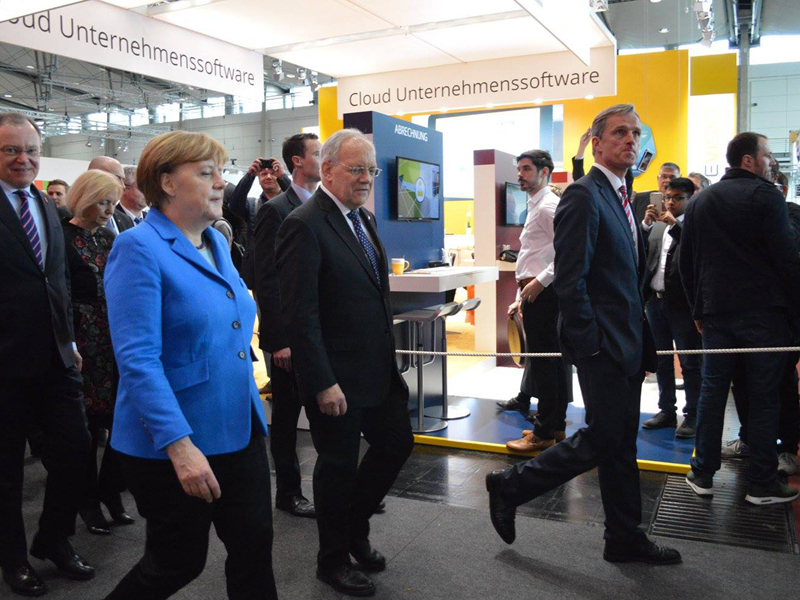 Cloud Unternehmertag on 16.01.2019 in Bonn. Summer Slam 2017 in Bonn: Interviews with organizers and initiators. 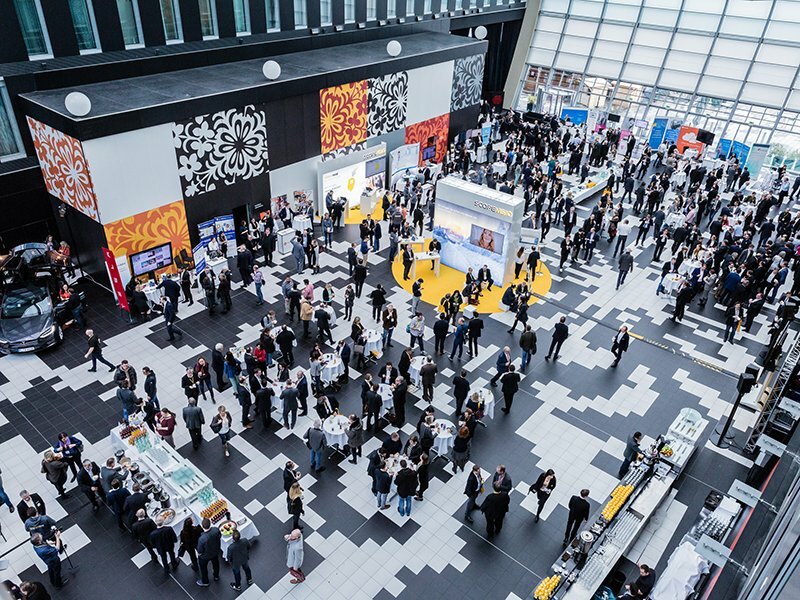 In 2015 the Beirat Digitale Wirtschaft NRW in cooperation with the ministry of economics has developed a strategy for the digital economy in North-Rhine-Westfalia. In this interview Dr. Jörg has describes his point of view regarding this. 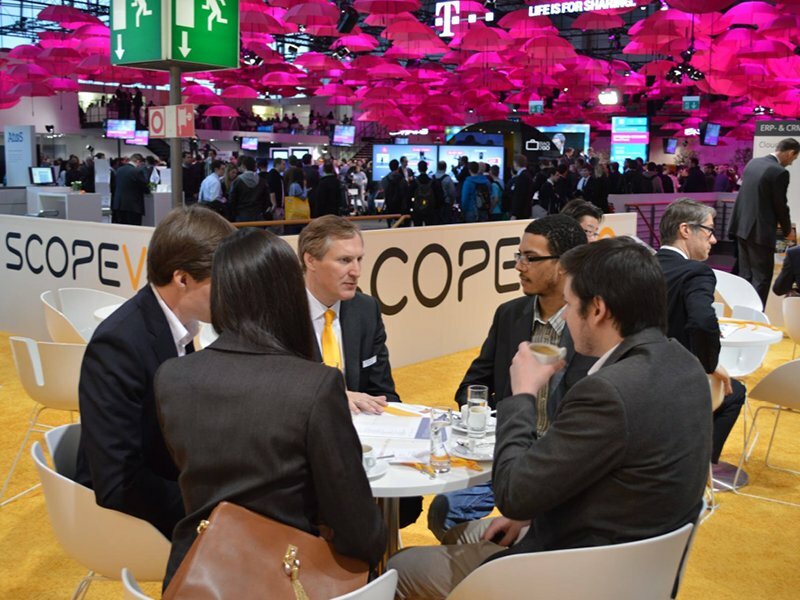 Scopevisio founder Dr. Jörg Haas is demonstrating the digital voice assistant „Scoper“ at the CeBIT in march 2017. 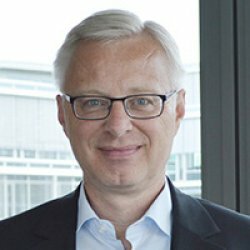 Interview with Dr. Jörg Haas about „artificial intelligence in companies“ from january 2017. Dr. Jörg Haas, founder of Scopevisio is delivering a presentation about artificial intelligence at CUT 2017. Impressions from the CUT 2017. Dr. Jörg Haas, founder of Scopevisio AG, is explaining this year’s motto of the Cloud Unternehmertag (Cloud Entrepreneur’s Day, CUT) 2016: “Enterprise 4.0 – Leadership by Integration”. With more than 600 visitors the CUT 2016 has outnumbered the previous CUTs by far. Its subject, digitization, was examined by some inspiring keynote speakers from different points of view and for various industries. 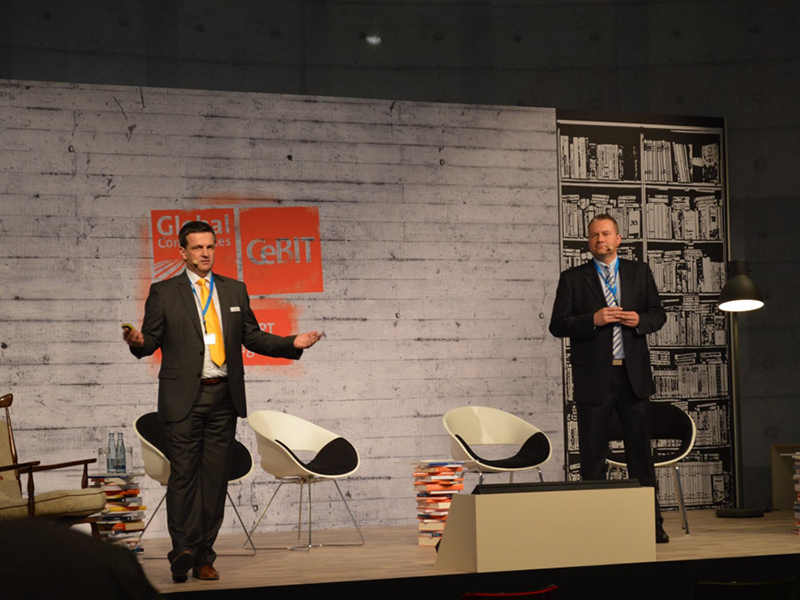 Jörg Haas is delivering a speech on the subject „The cloud – an economic miracle within medium-sized businesses” at CeBIT 2015. Cloud, “German Angst” and encryption: CenterDevice Managing Director Michael Rosbach is being interviewed at the “BUSINESS DAY 2015” of Cologne Chamber of Commerce. 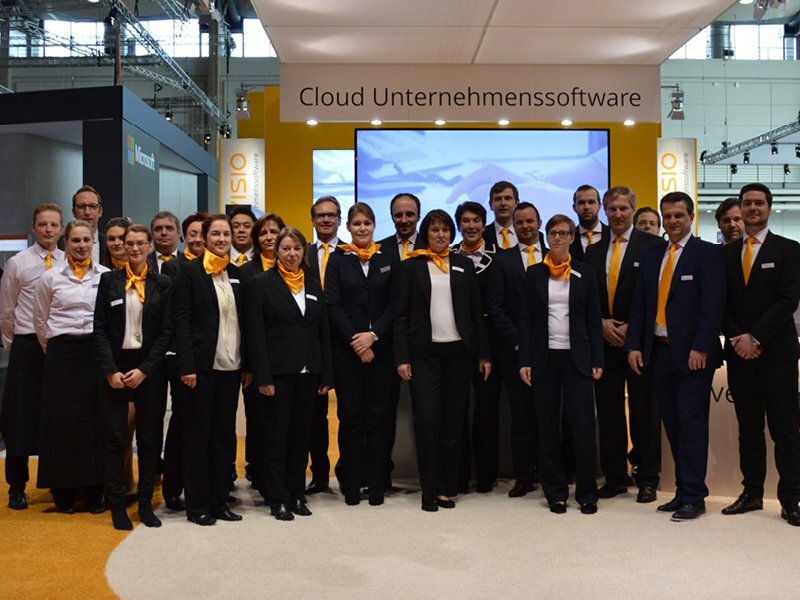 “Scopevisio – Cloud-based Business Software”; Interview at CeBIT 2014. The first half of the 21. century will be remembered as the age of the digital change. Never before we had such a profound change in our society as well as in our business life. The Digital Transformation of our traditional way of life and our business areas is moving on with an increasing speed. The 4.0 social and economic revolutions are characterized by an artificial intelligent automation. 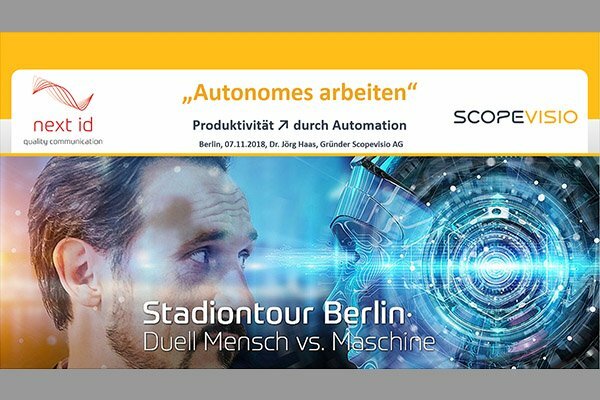 Scopevisio shows how disruptive an integrated and business process orientated cloud based software appeals by using Artificial Intelligence procedures. For example Scopevisio is working on a pattern recognition of Deep Learning and Deep Recognition, on an abstract, multiple usable expert system based on the extended Boolean Algebra, the mastery of vagueness via fuzzy logic as well as voice command based on extended predicate logic and phonetics. “The world of business software of today has not a lot to do with the world of tomorrow – and all this is provided via internet, carefree and safe and to a fraction of the costs of today. A presentation dated 15.12.2016 at the Where2B conference in Bonn. Which radical digital transformation is about to affect hospitals? A lecture on the occasion of the 20-year anniversary of the association of hospital CIOs. In this lecture we will try to answer the question “What will hospital IT look like in 10 years?” In 2016, our society is in the middle of the 4th economical revolution, often referred to as Industry 4.0 or, in a cross-sector perspective, als Economy 4.0. It is no coincidence that this evolution is happening at the same time as third generation IT is replacing the client-server paradigm of personal computers by a cloud computing paradigm featuring the common computer. How will the “4.0 movement” impact hospitals and will patient treatment be greatly affected by it? What do “4.0” and “3rd Generation IT” actually mean? Will future hospital information systems be provided on a virtual, on-demand basis by IT service companies? Will IT personnel in hospitals still be there 10 years from now? Do hospitals have a potential for introducing “humanless work”, i.e. era 4.0-style automation and robotics? Is cloud computing an option for hospitals at all? Yes, hospitals are affected by this mega-mega trend like any other industry. It is impossible for them to stay out of the digital world. In the next 5, 10 or 15 years hospitals will experience profound changes. Technical progress is inevitable. Today, many companies are faced with the question: In which way will digital transition impact our business model? Entrepreneurs are asking themselves: Will my business too have to go through a digital transformation? How quickly, how profoundly will this change process affect my company? This presentation will discuss how SMEs that use Scopevisio business software are embracing digital transformation. I will point out that this transformation is really not a threat but a blessing. Service companies find it much easier to work with state-of-the-art cloud business software. The discussion is centered around automation of standardised services. I will point out what is Scopevisio’s main objective and how integrated, business process-oriented cloud software 4.0 is about to shape the future. As a result, solutions will be much more affordable and globally available for mobile work. Phenomenons such as Internet of Things (IoT), cloud computing or big data are bringing about a fundamental technological change that can be viewed as a new age of information technology. While the young generations X (of age 30-45) , Y (of age 15-30) and Z (of age 1-15) have been experiencing the digital world from their birth on as a matter of course and therefore are embracing techological change in the most natural way, many entrepreneurs of age 45+ are still seeing digital change as an undiscovered country. Numerous middle-sized companies are still assuming that this chance will not impact their businesses. However, if older business people miss the rapid transition to a virtual and digital working sphere, their companies probably won’t survive the Digital Revolution of the next 5 to 15 years. 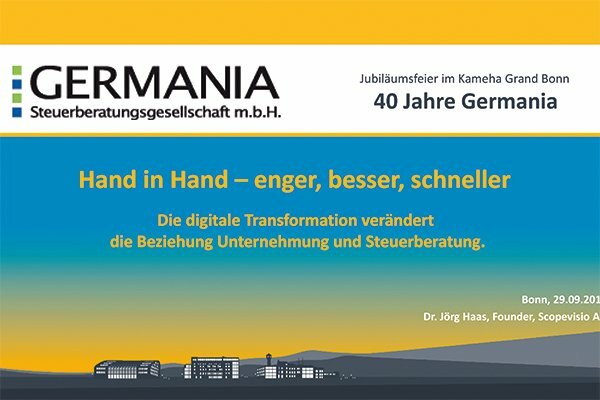 In the following presentation, Dr. Jörg Haas will discuss the economic miracle of Digital Revolution (=4.0) and will explain, that it will bring many more opportunities than risks to open-minded business people. 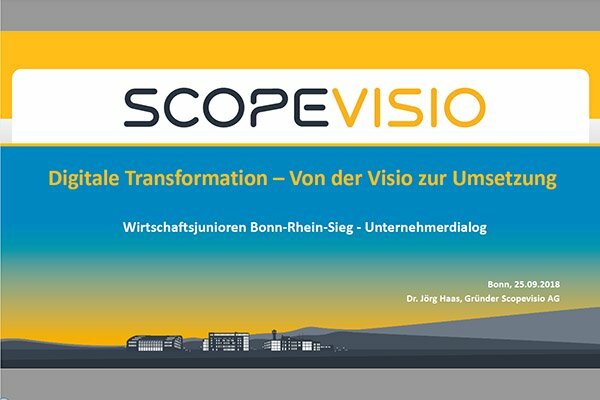 Dr. Jörg Haas, co-founder, Partner and Board Member of HW PARTNERS AG, as well as founder of Scopevisio AG. Cloud Computing – a Superior Technology! At the interface between science, innovation and entrepreneurship! To be doing R&D in a practice-oriented science is not a guarantee for economic success, even if the scientist makes a decisive contribution to the marketability of innovative products. It is not enough to recognize cloud computing as a superior technology, you also have to put it to use of the customer and create easy-to-use, manageable solutions for the market. We will show why cloud computing has great benefits for businesses in the economic arena. Taking Scopevisio AG as an example, we will discuss how to build a company that translates this technological edge into the development of an innovative business software with outstanding customer benefit. In this fashion, innovation innovation is being used as the driver for a profitable business development. Europe vs. USA – Which CRM Application is Better? Salesforce is the most successful cloud B2B software of the world in the Software as a Service (SaaS) business model. In the year 1999, Marc Benioff was the first one to be offering B2B software on demand on large scale. The following essay will give a short overview of Salesforce’s success story. After that, we will discuss the entrepreneurial, methodical, techological and subject matter parallels and differences between Salesforce and Scopevisio. Based on both solutions‘ approaches, we will also take a look at the different ways US businesses and European companies think and act with regard to economic behaviour. Once it was SAP vs. Oracle, while in today’s cloud era it is more like Scopevisio vs. Netsuite or Salesforce. The generation change has already begun, even if most people haven’t noticed it yet. Virtual is the opposite of physical – not of real! A virtual work environment is a form of work organisation where physical presence at a given location is no longer required. Virtual work is characterised by a limitless enterprises and flexible work conditions. In virtual work environments business processes are inherently asynchronous in terms of time. A disruptive technology is an innovation that can force an existing technology completely out of the market. Innovations are mostly created in new markets and often come as a surprise to the established providers. In the long run, these markets usually exhibit a strong growth and supersede existing products wholly or partially. The book is the result of many years of scientific and practical experience in the area of ​​innovation management. It is based on the perception that innovation and marketing must be inextricably linked. The book provides cutting-edge insight in both scientific and practical matters. It starts with a description of current technological trends and evolutions. The focus is on key technologies that are crucial for the digitization of companies, such as cloud computing, the Internet of Things, Semantic Web and Big Data. The authors believe that textbooks on innovation management and innovation marketing should also take these development trends into account. Particular emphasis is laid on the systematic distinction between product and service innovations. The usage innovations introduced here relate to services in which companies generate revenues from the application of innovation on the customer side. Corresponding lease and pay-per-use pricing models are becoming more and more important with regard to digital products. These pricing models are also used by the affiliate companies of HW Partners. Most international providers of cloud business software concentrate their offerings on pure cloud software that is provisioned to the customer as Software-as-a-Service (SaaS). Thanks to the user-friendlyness of the software and the fast implementation, very few additional services, if any, are required to get up and running, providers point out. 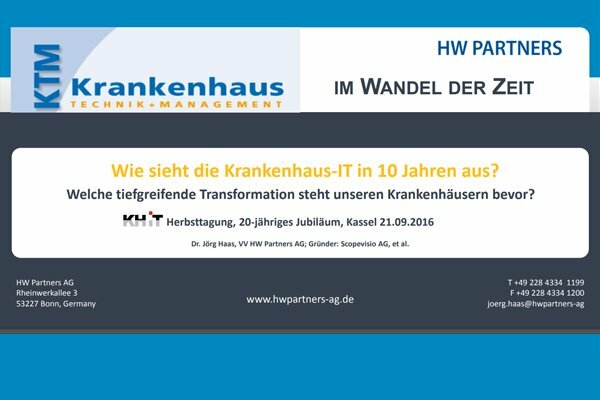 Dr. Rüdiger Wilbert, co-founder, Partner and Board Member of HW PARTNERS AG, as well as founder of Scopevisio AG. Since 2004, the term Cloud Computing started to become popular among a broader public, when companies such as Amazon, Google, Salesforce and Facebook used it to describe their own infrastructure. Some years ago a couple of leading institutions – first and foremost the National Institute of Standards and Technology (NIST) – have set out to find a common definition of the term “Cloud Computing”. Some thoughts on data management in business applications and at Scopevisio. the wide-spread use of relational data bases in business software is, among others, due to the fact that table-style data structures are easy to understand. They are highy in demand because they are generally accepted. 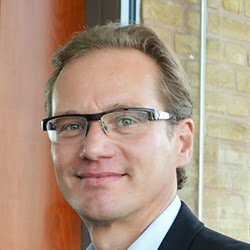 Dr. Markus Cramer is head of product management and development. In the discussion of the new megatrend cloud computing, large cost-saving potential is generally on top of the agenda. And the cost for new cloud-based business solutions actually appear most attractive: Cloud-based billing software is already available for as little as five Euros per month, while prices for accounting software start at ten Euros per month.